lion’s first day of preschool! i have been meaning to sit down and write about my littlest guy, but with all this back to school business, it’s been hard to find time. when your whole life turns into looking at a Child care finder, it can be quite a struggle to find the time to constantly be writing, especially when you have found so many great preschools. but, new chapters have started up this september for lion. 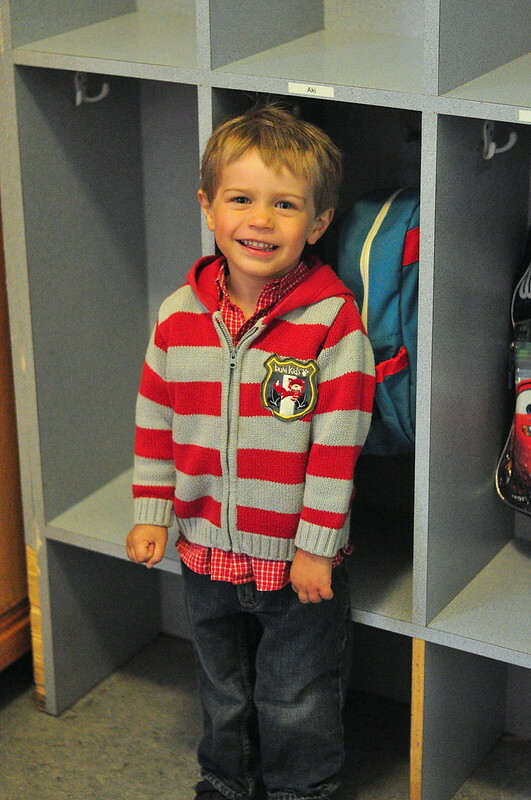 he is 3 years old now and started at his new montesorri preschool last week. i was a little nervous, because i didn’t want to push him into anything he wasn’t ready for. and, i was remembering the tears his older brother shed at those dreaded drop-off’s in the morning when he was in preschool. bear always clung to my thighs and had a hard time acclimatizing; apparently he didn’t talk for the first few months! mandatory first day of school picture! lion was a little tired. that being said, i wanted to at least provide lion an opportunity to have something of his own in his life. our life is quite busy with bear’s school; drop-off’s, pick-up’s, committee things, and so on. i was quite nervous on lion’s first day. 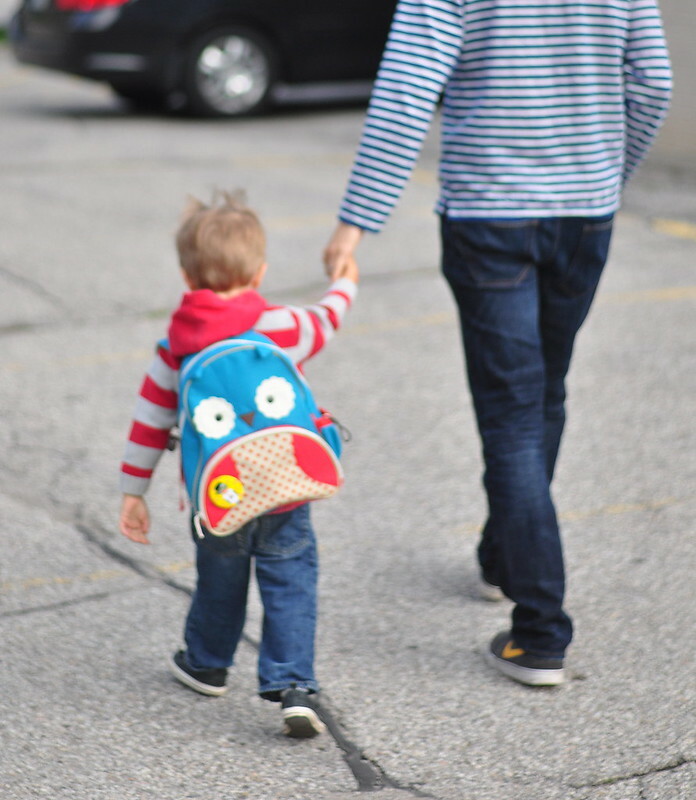 we had to drop off bear at his first day of senior kindergarten, before we could get to preschool. lion and i packed his backpack with a few important items before leaving the house. 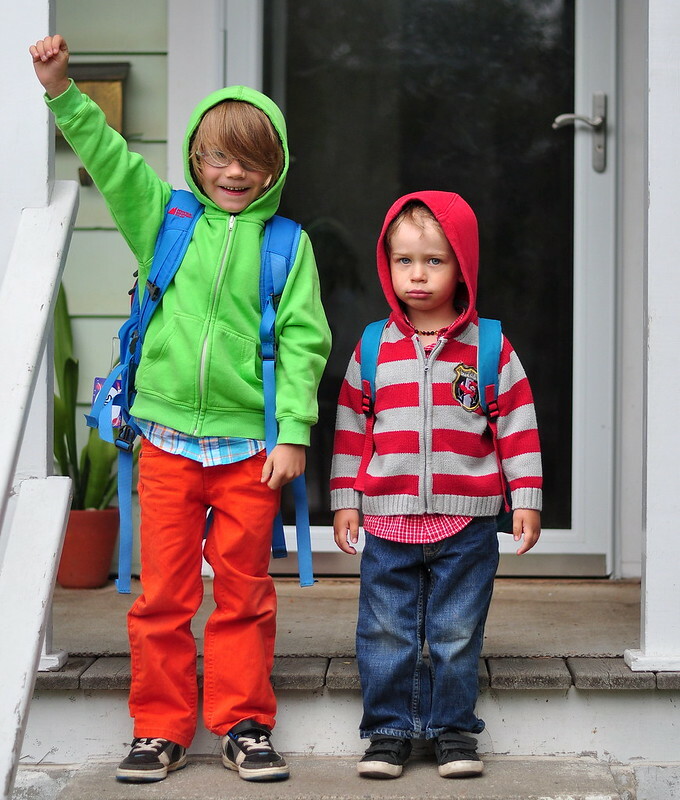 this step was very important to him, especially since his big brother was lending him his old backpack. and, big kids have backpacks, not babies. so, we arrived at the school, walked in to the school hand-in-hand with dear hubby and lion just walked into his classroom, all non-chalantly, and he waved good bye! he was so eager to start playing with his new friends that saying good-bye was completely forgotten! i called him back for a quick hug and a kiss, then off he went. no tears, no apprehension, no anxiety, no worries! at least not from him. standing proudly in front of the cubbies! i on the other hand, went into what oprah called the “ugly cry”. i sobbed and sobbed in the car, tears streaming down my cheek. i was bursting with pride, but also feeling the bittersweet twinges of reality : my kids were growing faster than i could keep up! two-and-a-half hours later when i went to pick up lion, he was all smiles! he gave me a huge hug with a sloppy wet kiss! he was excited to tell me about his morning, and i was so thrilled to share this moment with him. he sounded so mature, well as mature as a three year old can, as he told me about the puzzles he worked on and the painting he painted. the best part was that i could see that he was feeling proud and good about himself for enjoying his first morning at preschool! i’m not sure if i could feel more proud of him! how did your first days back at school go? Oh my, your boys are so cute. The little guy smiling in front of the cubbies is priceless. Lovely pictures. I so identify with the “ugly cry” – I’ve had a few of those myself. It’s challenging to see them growing up and changing so quickly.